On Wednesday, I wrote about a battle looming between Apple and Google as discussions take place over the possibility of Apple making Microsoft’s Bing the default search engine on the iPhone. Although the company started in search and made billions of dollars in search-related advertising, it recently made the move into mobile software and hardware. Google is also moving to the desktop as hardware companies consider using Google’s Android operating system for tablet PCs and netbooks and Google continues developing its own Chrome OS. Google’s recent foray into mobile phones, with the Nexus One, signals a big shift for the company, but the lack of customer service might hinder customer adoption of its mobile products. Microsoft really competes with everyone. It is on the desktop, in the cloud, on mobile devices, in your living room, answering search queries and navigating you to your favorite restaurant. So what’s next? Although the company invested in Facebook, and it offers some social features on its Xbox platform, it still needs to make a major leap into social networking. Another major gap is mobile phone hardware. Apple’s success with Mac personal computers, the iPod, the iPhone and iTunes has allowed it to step back from the fray and avoid competing in search, news, maps and social networks. But the recent competition with Google over mobile phone software might change its attitude. Apple has close to $34 billion in cash and securities, which means that it can afford to make some big purchases in the search market — or any other market for that matter. 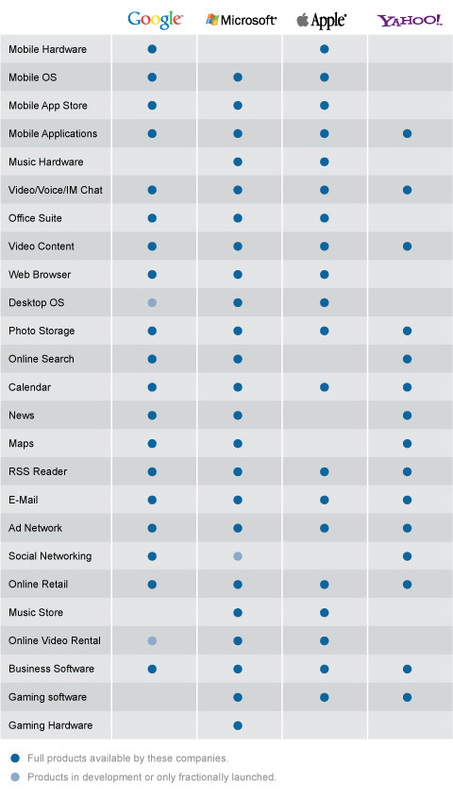 A side note: While looking at the comparisons of these four companies, it’s especially interesting to see that Apple is the only one of the four that charges for its online services, including calendar, contact sync and Web mail. Google, Microsoft and Yahoo all provide these cloud-based products free of charge. Yahoo has not really added any new products or services over the last year, but it seems to do best with content-related products. Yahoo News is still the No. 1 news site, and Flickr continues to grow and remain a highly successful photo Web site. As the race really pushes toward mobile over the next few years, it’s going to be interesting to see how Yahoo decides to play in that space.